Get 20% discount in "Oat & Whey 500g" and save 4,68 zł. Get 20% discount in "Oat & Whey 1Kg" and save 8,58 zł. Get 20% discount in "Oat & Whey 2Kg" and save 15,60 zł. 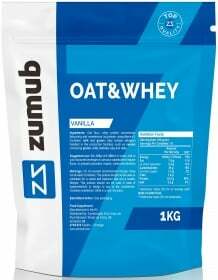 Zumub https://www.zumub.com/images/large/zumub/zumub_oat_whey_1kg_LRG.jpg 5ZUM9348 Nie ma jeszcze żadnych recenzji. Have a question about Oat & Whey? What is it, what does it do, how and when to use or something else? Ask us. Mix 100g with 350ml of water, milk or your favourite beverage, or use as a substitute for regular flour, to prepare pancakes, crepes, cakes or desserts. OSTRZEŻENIA Oat & Whey : Do not exceed recommended dosage. Keep out of reach of children. This product should not be used as a substitute for a varied and balanced diet & healthy lifestyle. This product should not be used in case of hypersensitivity or allergy to any of its constituents. Contains sweeteners. Store in a cool, dry place. Please Recycle. BEST BEFORE: Please see lot number and expiration date stamped on the packaging. Uwaga: Jeśli nie masz wątpliwości związane z zażywaniem tego produktu, skonsultuj się z lekarzem lub dietetykiem. Wartość odżywcza produktu może różnić się nieznacznie w zależności od wybranego smaku.